Q. My neighbor has a couple of young children. She and her husband (he’s not Catholic) manage to get their kids to religion classes, but I never see them at Mass. Is there anything I could say to encourage them to come to Mass? Or should I stay out of it? A. Stay out of it? I’d say, by all means, jump into it head first! But let me explain. What you describe is, unfortunately, not all that uncommon. Let me first start by highlighting a very positive point. The simple fact that this couple get’s their children to religion classes is excellent. In my experience, parents who don’t always practice their faith still feel drawn to make sure that their children get, at least, the basics of the faith. I believe that one thing this points to is the deep conviction God puts on the hearts of parents to do all they can to pass on the faith to their children. So bringing them to religious education is a great start. But it’s not the end. 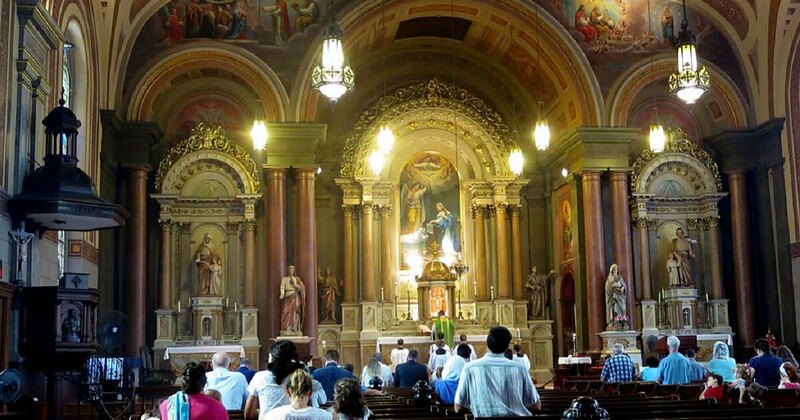 People fall out of the practice of attending Mass for a whole variety of reasons. Some have been hurt by individuals within the Church, some do not fully understand some aspect of Church teaching and turn away because of confusion or anger, some simply have fallen out of the practice of going and some are so busy that they find it easier to simply sleep in Sunday mornings. But I believe that one of the most common, and unspoken reasons is that many people carry heavy guilt because of past sins and for some reason feel like they don’t belong. When they do attend they feel out of place and find it easier to simply stay away. But whatever the reason is for not attending, most parents still recognize their responsibility to pass the faith on to their children. This reveals that, at least deep down, they still believe. So that’s where I’d start. Look for opportunities to begin simply talking about your faith. Share some positive experiences of your own with your friend. For example, if you hear a homily that stands out in your mind, look for a casual opportunity to simply say something like, “I was at church last week and the priest said this…and it was really helpful to me.” When you share from your own experience it is very non-threatening to others. And if you do it such a way that you are simply sharing your experience and not telling them what to do this may be the best way to plant the right seed that may begin to grow. However, this may take time. So don’t grow impatient with your friends. Just keep planting seeds without sounding judgmental. Sometimes it takes just the right seed to be sown at just the right time. When this combination happens you may be surprised at the results. So that’s what I mean when I say, “jump in head first!” Share openly, freely and often. If your friend wants to continue the conversation that’s great. If not, look for the next opportunity to share something from Church or about your faith.